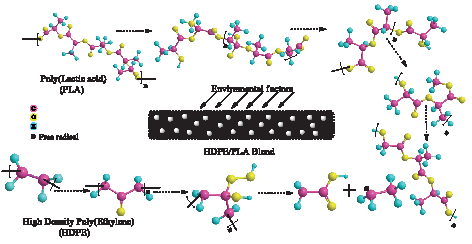 High density polyethylene (HDPE)/polylactic acid (PLA) polymer blends were synthesized by the extrusion process using different molar ratios (95:5, 90:10, 85:15 and 80:20) in order to evaluate the effects on their structural, morphological and mechanical properties as well as on the degradation rate. The as-obtained materials were characterized structurally, chemically, thermally and morphologically by Fourier transform infrared spectroscopy (FTIR), X-ray diffraction (XRD), differential scanning calorimetry (DSC), atomic force microscopy (AFM) and scanning electron microscopy (SEM). The mechanical properties of the extruded blends were characterized by the tensile and impact test, whilst the degradation process was studied by environmental composting and accelerated weathering. Independently of the PLA amount, the samples showed coarse droplet morphology; however, it causes an important crystallinity reduction. Slight changes in the mechanical and thermal properties were also observed. The best performance was achieved with the 85/15 molar ratio, which showed a lifetime decrease close to 60 % in comparison with HDPE.